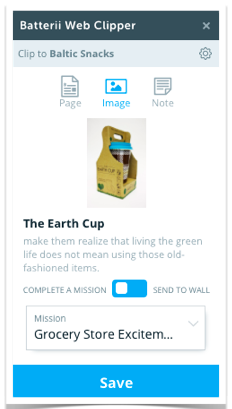 Use the Batterii webclipper to clip the page or an image to a Wall or Mission. Reading an interesting article or see an image you want to capture for future use, the easiest and fastest way is to clip the information into Batterii. Click on your Web Clipper extension and enter your community URL. You will only need to enter this once as it will retain your community URL going forward. Page - A screenshot style image of the whole page will represent what you are clipping to Batterii. Image - Select an image you want to represent the page you are clipping to Batterii. Screenshot – Create the image by taking a screenshot of a specific section of the page. Once you select the clipping type you can add the Name and Description. Page will automatically scrape the name and description for you but you have the ability to edit both within the clipper. Image and Note will leave both blank initially so add a name and description that will convey the importance of the clipped content to other room participants. 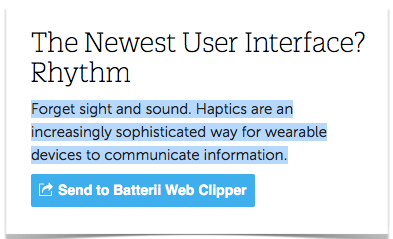 Tip: Highlight a sentence or paragraph on the page and "Send to Batterii Web Clipper" will appear. 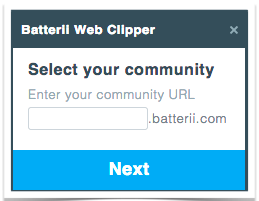 Click the "Send to Batterii Web Clipper" button and the highlighted content will instantly be added to the description section of the clipper. 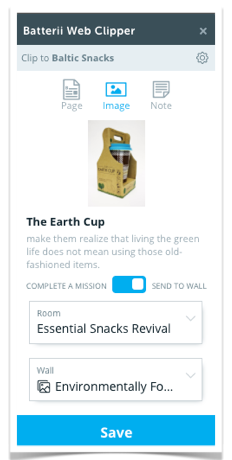 Now choose the Room and the Wall destination for the content you are clipping. Once you select the room you are clipping into the Walls selection for the whole room will show for your choosing. Click "Save" and it will be immediately added to your community. Clipping to a mission is just as easy. Follow the same steps as above just switch the toggle button over to "Complete a Mission", your Mission options will show below. 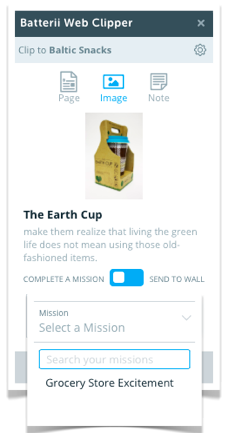 Select the Mission and click "Save". Tips: If you are having an issue logging into the clipper - check out this Web Clipper Trouble article to see if this solves the problem.